Evergreen Personal Injury Counsel attorney Stephen Bulzomi has officially stepped down from the Washington State Association of Justice Board of Governors. Stephen has served on the board since 1998, and acted as President from 2013-2014. The Washington State Association for Justice is the oldest and largest civil justice advocacy organization in the Pacific Northwest. The board works with top law firms, attorneys and legal professionals in Washington to advocate and protect the legal rights of injured or wronged consumers, citizens, patients and workers. “The Washington State Association for Justice has successfully led efforts to prevent unfair restrictions from taking effect and preserve the right of full access to the civil courts and justice system,” Stephen says. “I’m incredibly proud to have been a part of the WSAJ mission to protect and preserve access to justice for everyday citizens,” Stephen says. 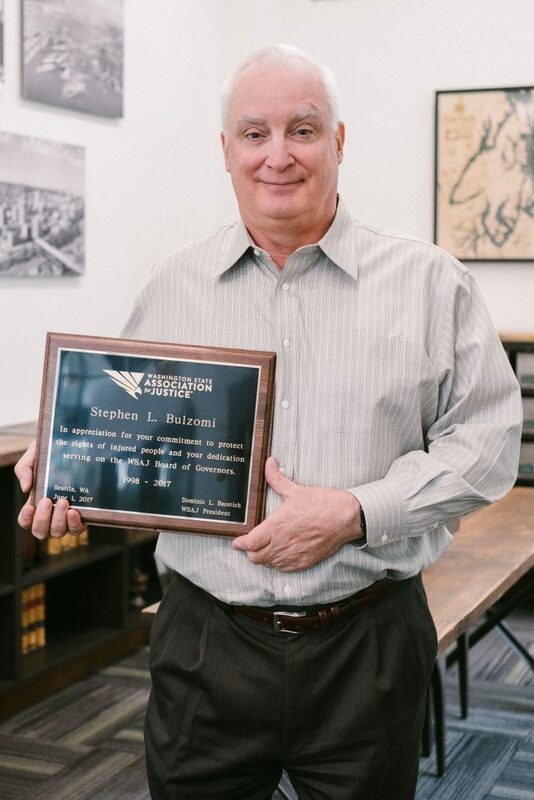 On behalf of the entire team at Evergreen Personal Injury Counsel, we would like to congratulate Stephen on his 19 years of service on the board.